Ketchikan, AK - The $9.5 million M/V Lituya, the tenth motor vessel to join the Alaska Marine Highway System (AMHS) fleet, arrived in Ketchikan Saturday afternoon one day earlier than expected. The new vessel departed Morgan City, Louisiana on March 12th enroute to Ketchikan via the Panama Canal. The new M/V Lituya was greeted by a rainy day when it arrived Saturday. The new ferry arrived at approximately 2:00 pm and docked at the Ketchikan Ferry Terminal. The new 180-foot, roll on/roll off steel ferry accommodates 18 cars and 150 passengers. This new vessel will provide regular, dedicated service between Ketchikan and the community of Metlakatla. Twin engines, each with about 1,000 horsepower, will enable the ferry to operate in open water at speeds up to 12 knots. The design is similar to vessels used as offshore supply vessels (OSV) for oil field work. According to the Alaska Department of Transportation, this robust vessel could be operated in other open water areas in Southeast Alaska, so plans are to study its performance closely. The new vessel's rugged design will allow it to safely operate the 16.5 nautical mile run between the existing Ketchikan and Metlakatla terminals. Alaska statute requires each State ferry to be named for an Alaskan glacier. Traditionally, the State has shared this task with Alaskan school children by holding a contest in which students write a short essay nominating their favorite glacier for the name of the next ferry. The winning essay naming the M/V Lituya was written by Josiah Milne when he was a second grade student at Metlakatla School. Milne's essay will be framed and hung on the Lituya. Students have named four ferries in the past six years. 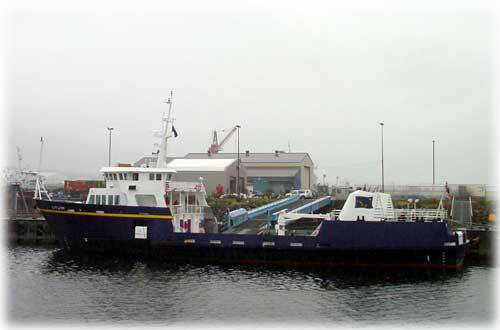 The new ferry is expected to be in service by May 2004.